Last weekend, several goddesses gathered for a “New Moon in June Goddess Ceremony: A Celebration of Luminous Women Sisterhood.” Oh my gosh, that was a super-fun and profound experience! 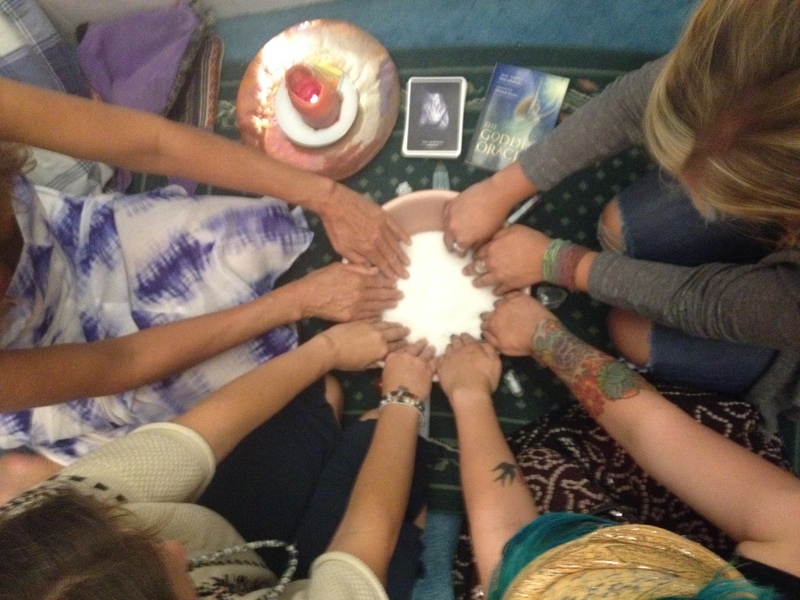 We found a suggested new moon ceremony format from Mystic Mamma to use as a starting point, and then co-created a sacred space together and the perfect sharing and ritual for where we all were in our spirit-journeys. One thing we used from Mystic Mamma is a bath salts ritual. We each brought essential oils, herbs and/or flowers, then poured a large bag of bath salts into a bowl. We each took turns stating our intentions, adding a drop of oil as an offering into the salt for each intention. Then we mixed the salts all together with our hands, and divided up the scented salts for a home-coming package, with the intention of having a full-moon bath in the salts in two weeks. In the bath, we can each reflect on where we are in reaching our intentions and what else might need to shift in order for us to reach the potential of our higher-selves. What I notice is that in sharing intentions in ritual or ceremony, especially with witness(es), spiritual energies gather to meet and support us in profound ways. Then it’s for us to accept the way that Spirit supports us – letting some things fall away and other things gather, empower, and support us. Manifestation is faster than ever, especially when we align with our higher selves and our divinity. Having follow-up support from family, friends, beloved, soul-sisters and –brothers, and/or from spiritual professionals is also profoundly helpful. I am also guided into solitary ceremony on July 6, following the energies of the solstice, new moon and then coming into the “sacred date” (according to my angels and guides) of 7-7-14. Rumor has it I will be sleeping in the enchanted forest of OdaBe that night, on the earth (sleeping bag – yes; tent – no), welcoming shaman’s death and rebirth (again). I will keep you posted! There’s much happening in preparation for this new dawn. What role do ritual and ceremony play for you? Who do/would you include in spiritual community? Who can you count on to support you, even when your inspirations take you away from norms of conformity? How may you go deeper into community, sisterhood or brotherhood? What in your life may fall away as you align with your dreams and potential? This entry was posted in Conscious Evolution, Relating, Spiritual Entrepreneurs and tagged ceremony, community, goddess ceremony, moon ritual, ritual, sisterhood, solstice. Bookmark the permalink.